In high school mathematics, we were taught to write proofs in two columns. There are some proofs however that are easier to understand if we use Algebra. The triangle angle sum theorem that I have posted yesterday can be proven algebraically. Its proof which I think is easier to understand is shown below. Let be a triangle with angle measures , , and . 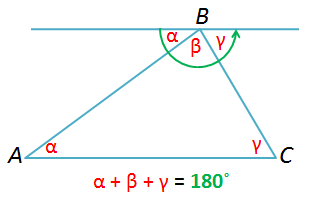 In the figure above, angles having the same Greek letters are congruent since they are alternate interior angles. Now, because they form a straight angle. But is the sum of the interior angles of a triangle. Therefore, the sum of the interior angles of a triangle is .